"Archery Cat" is a game of target shooting. Do you think you are a good archer?? Or do you assume yourself as a good target shooter?? Let's check it out with the new "Archery Cat". 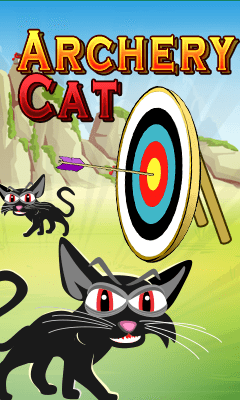 In "Archery Cat" you have to scroll right to have a look of the animals(Target). And then come back to your Bow and arrow to shoot the bird. Now adjust the power to be exerted to your arrow and release it. Increasing levels will introduce new twists,hurdles and different number of animals. In some levels birds are hiding behind box, and in some animals are in cage. So you have to first destroy the box or cage first to shoot the animals. So try to get high score by shooting sharply. So Download "Archery Cat" for free and test your skill. Have fun. ENJOY!!!!!! Download and enjoy. Do provide your feedback as review.